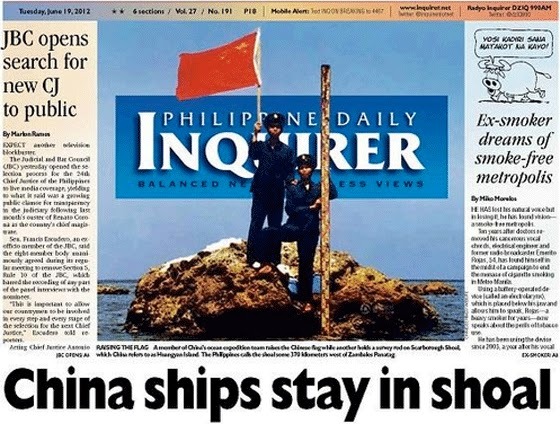 The PRC is in a pretty solid position, legality-wise in occupying Scarborough Shoal. And that means it’s pretty much free to build on it. Even island-build it. The United States and the Philippines know that. Losing Scarborough Shoal was the price of the pivot. It’s just hard to admit it. Back in May 2012, a little-known figure in the US government, one Hillary Clinton, declared that the United States took no position on the sovereignty of the Scarborough Shoal. [Clinton] voiced concern about Scarborough Shoal, repeating that Washington does not take sides on competing sovereignty claims there but has a national interest in maintaining freedom of navigation as well as peace and stability. Unsurprisingly, the fact that Hillary Clinton affirmed US neutrality on the issue of Scarborough Shoal sovereignty is not on the lips of every China pundit handwringing over current PRC banditry in the South China Sea and searching for pretexts to block PRC island-building on the Shoal. Perhaps China hawks find Clinton’s statement something of an embarrassment, especially since it undercuts the policy/legal justification for some of the more extravagant plans for frustrating the PRC’s purported Scarborough schemes—like the brilliant idea of sending SEALS to covertly sabotage PRC dredgers. Or the even more brilliant idea of sending 4 A-10 Warthogs (air to surface combat) and 2 HH-60G Pave Hawks helicopters (insertion and extraction of special ops personnel) to put some credibility behind the threat. Which we already did. If the PRC can island-build Scarborough Shoal unchecked, it would represent an embarrassing piece of blowback for the pivot, and a pivot-sapping political incubus for pro-US political and military figures in the Philippines. 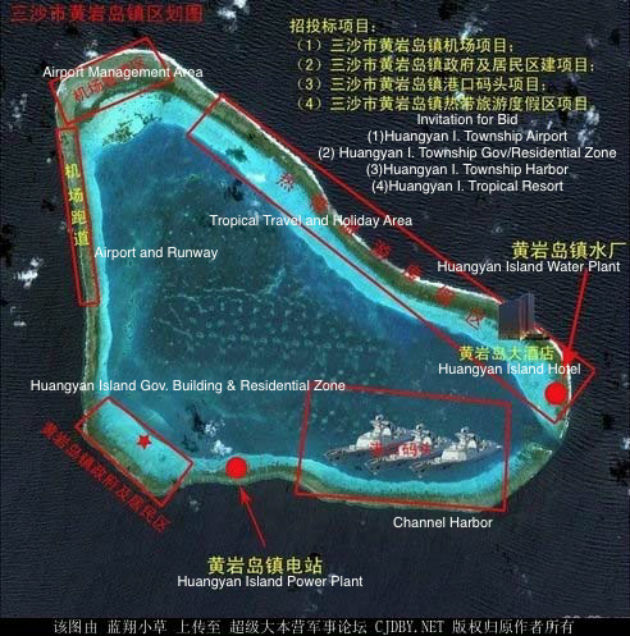 The best lawfare gambit available is to declare that dredging the shoal would violate environmental protection standards in UNCLOS; however, the idea that PRC could be targeted by a R2P2 (Responsibility to Protect Polyps) military operation has, for some reason, not acquired its sea legs, perhaps because the idea that the US would engage in an act of war to enforce environmental norms in a treaty it has not even ratified has not quite caught on. The Scarborough Shoal dilemma is well understood in Manila. As the crisis evolved in 2012, the Philippines had expressed hopes for a US statement that the Mutual Defense Treaty covered Scarborough Shoal, something along the lines of the US declaration that the Senkakus fell under the US-Japan security treaty. Remember, pivoteers, that the US returned the Senkakus to Japanese administration in 1979 but has pointedly never acknowledged Japanese sovereignty over them even as the Obama administration affirmed they were covered by the security treaty as “territory administered by Japan”. The sovereignty issue was supposed to be worked out in negotiations involving China and Japan but the Japanese nationalized several of the islands instead in 2014, a big middle finger to the United States as well as the PRC. So, in theory, the Philippines might hope that Scarborough Shoal could merit similar consideration from the United States, as a disputed sovereignty territory that the US has decided, nevertheless, to include under its defense umbrella. Problem is, as Hofstra’s Julian Ku points out, the MDT affirms that the obligation of the United States to come to the aid of Philippine armed forces when they are under armed attack in areas under their jurisdiction. Since Scarborough Shoal is not under Philippine jurisdiction, and there are no Philippine armed forces there to suffer attack, that dog didn’t hunt, at least in 2012. In May 2012, Hillary Clinton’s refusal to put Scarborough Shoal on the US-Philippine agenda was seen as a humiliation for the Philippines, a sign that the Philippines was a second-tier ally compared to Japan. In retrospect we might say that yes, it was an affirmation that by virtue of the Philippines’ eviction of US military forces in 1992, it only rated second-tier ally treatment compared to Japan… and it was time for the pro-US element in the Philippines pick up its game. China hawks in the Philippines (and, I suspect in the United States) did not want to see a positive or dignified future for an essentially non-aligned Philippines mired in protracted and inconclusive bilateral negotiations with the PRC over Scarborough Shoal, fishing rights, hydrocarbon plays and whatnot, perhaps generously larded with the corruption allegedly associated with the PRC-friendly posture of the previous Arroyo government, while at the same time free-riding off the Mutual Defense Treaty. Instead, leadership in the Foreign Affairs and Defense ministries pushed for overtly siding with the United States and upgrading the relationship to a more robust level (culminating in the de facto return this year of the US military to Philippine bases under the Enhanced Defense Cooperation Agreement or EDCA), thereby promising the overmatched and underequipped Philippine military and security forces more lethal if not necessarily more effective support from the US against internal as well as external threats. From that perspective, the Scarborough dispute–a sovereignty beef which could not bring US military power to bear on the Philippines’ behalf but virtually dictated bilateral engagement with China–was a dead end. As I’ve written here, a flock of China hawks sabotaged the mid-year 2012 bilateral negotiations conducted by President Aquino through his envoy, Antonio Trillanes, for both sides to withdraw from the shoal. …while leaving the PRC in occupation of Scarborough Shoal. The pivot had a cost, in other words, and that cost was Scarborough Shoal. And UNCLOS isn’t going to help. The Shoal is above water at high as well as low tide, so it falls outside of the purview of UNCLOS—and the Philippines’ UNCLOS arbitration. If the Scarborough Shoal was under water some or all of the time, UNCLOS would rule and the arbitration commission could assign it to the Philippines as part of its EEZ endowment—but it ain’t. And the Philippines has acknowledged that. Best UNCLOS can do is either declare that the Shoal is capable of sustaining a human population and economic life, meriting a 200 nautical mile EEZ, unlikely well impossible in its current configuration, or only a 12-mile territorial sea. As to whose territorial sea it is—and to whom Scarborough Shoal belongs—well, UNCLOS got nuttin’. To be harsh, the awkward fact is that the Philippines did not “lose” Scarborough Shoal; it threw it away. I imagine awareness of this politically toxic sacrifice underlies the ostentatious US breast-beating over Chinese plans for Scarborough Shoal, dictates useless Warthog flybys, and contributes to Ash Carter’s determination to up the US-Philippine military game and demonstrate heightened American commitment to the alliance. It might even explain the cancellation of Carter’s China trip in favor of a swing through India, Malaysia, and the Balikatan joint exercises in the Philippines. There’s a Philippine presidential election coming up, after all. ...With Its Own Floating Nuclear Power Station! 14 Comments to "The Price of the Pivot: Scarborough Shoal"
In a dispute between China, a high IQ, rising, industrial power and The Philippine’s, a low IQ, backward, barely functioning State which enjoys Anti-American posturing and thinks it makes sense to kick out American military forces and then demand American military protection, why would the USA bother going out on a limb for The Philippine’s? If The Philippine’s really care about Scarborough Rock and want the USA to give it to them, maybe they should start acting like a nation that is actually friendly and a good ally to the USA. At the very least it would be a start. When the United States gave the Philippines its independence in 1946, did the US hand over any islands in the South China Sea to the Philippines? No, none. But that did not deter the corrupt president Ferdinand Marcos from annexing 9 features in the Spratlys and renamed them the Kalayaan islands. As if that was not bad enough, the greedy Filipino then tried to grab the Chinese-owned Scarborough Shoal and got a black eye. The US handed the Daioyu islands, (which Japan grabbed in 1894 as a war booty and therefore had to return them to China under the Potsdam Declaration and the Cairo Conference terms but did not), to Japan for administration in May 1972, barely three months after Tricky Dicky Nixon went to China to sign the First Communique with Mao to start a detente. If that was not US treachery at its worst, then what it? Japan, under prime minister Noda, nationalized those islands that were allegedly not privately owned by a Japanese national in Sept 2012, exactly 40 years after Tanaka and Zhou En Lai agreed to shelf the decision on the Diaoyu/Senkaku islands to future generations to decide. When Abe came to power in Dec 2012, he refused to discuss the disputes with China and pretended not to know that Japan only had Administration of the Daioyu/Senkaku islands without any sovereignty, and that the nationalization in Sept 2012 by Noda was illegal. The meddling Uncle Sam closed an eye when Japan nationalized the Diaoyu/Senkaku islands and never questioned how could a Japanese citizen came to own a few islands, when the US handed the Administration of ALL the islands in the Daioyu/Senkaku to Japan in May 1972, without any sovereignty . Can Uncle Sam be trusted to do the right thing? No. Let’s hope that Trump wins the 2016 Presidential election and brings some sense back to America. @rob89 ”The meddling Uncle Sam closed an eye when Japan nationalized the Diaoyu/Senkaku islands and never questioned how could a Japanese citizen came to own a few islands, when the US handed the Administration of ALL the islands in the Daioyu/Senkaku to Japan in May 1972, without any sovereignty . Since the Senkaku islands are strategically important and Japan is friendly to the USA while China is not, it seems that ‘Uncle Sam’ emphatically did ‘do the right thing’ in making sure that Japan got to keep those islands rather than China. It would have been seriously weird if the USA had done anything other. If the US wants others to respect the rule of law and international norms, should it not, at the very least, start by showing other nations examples that Uncle Sam truly believes in the rule of law and international norms too, by first ratifying the UN Convention on the Law of the Sea, which it refuses to do since it came into force in 1994 and not allowing Japan to claim sovereignty over the Chinese Daioyu islands, which the Japanese grabbed as a war booty in 1894 and renamed them the Senkaku only in 1904 ? The US should respect the treaties like the Potsdam Declaration of 1945 and the Cairo Conference of 1943, it signed, calling for Japan to return ALL territories it stole through ‘greed and violence’. By trashing them how can the US be trusted? China is slated to have the world’s biggest economy after 2020 and by extension, the biggest military budget. 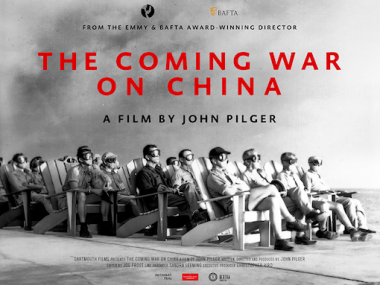 What if China follows the evil rules of engagement adopted by Uncle Sam now? Go figure. @rob89 You are arguing for the USA to act against its own interests and the interests of its friends, in the name of a very questionable legal dispute. That is the perfect way to lose respect and lose trust. To do that would make China despise the USA as weak and untrustworthy as well as make Japan despise the USA as weak and unreliable, and make every other nation in the world despise the USA as weak suckers. As for ‘evil rules of engagement’, why don’t you tell us all about Tibet? I am only asking the US to abide by the rule of law and international norms, when the US always seems to demand that others to do the same. Firstly, the US needs to ratify the UN Convention on the Law of the Sea if it wants to be taken seriously, when meddling in the South China Sea disputes. Secondly, in the interest of rule of law and international norms, which the US seems to want others to abide by, the US must not turn a blind eye when Japan nationalized the Daioyu islands in Sept 2012, violating the US handover of the Daioyu islands to Japan for administration only, WITHOUT giving Japan any sovereignty, in May 1972 . Since you want to know the history of Tibet, I like to advise you that the Mongols were the ones who annexed it in the 13th century when Tibet had no government, (just like Capt Cook claimed Australia for the British crown) and then incorporated it into the Yuan Dynasty when the Mongols ruled over China, until they were expelled at the start of the Ming Dynasty (1368 to 1644). When the Mongol retreated, they left Tibet behind as a Province of China. The British invaded Tibet and tried to annex it in 1904 but failed. In 1914, via the Simla Accord, the meddling Brits also failed to take over part of Tibet because a provincial Tibetan Plenipotentiary had no power to sign such a treaty. And when the present Dalai Lama was the spiritual leader of Tibet the peasants were serfs, who were allowed to keep only 25% of their farm produce they harvested. Many starved to death. When the Dalai Lama was in charge there were no metal roads or highways or hospitals or clinics or schools or railways. He alone had 4,500 slaves. Literacy then was hardly 5% then as only the Lamas and the Aristocrats could read and write. Life expectancy was below 45 and infant mortality was then the highest in China. And not to forget all Buddhists do not believe in the concept of God, like Christians do. At that time women who had twins were killed, as the Godless Lamas believe that she had consorted with the devil. When the Dalai Lama went into exile in 1959 on his own volition, the serf system was abolished by China. The farmers keep all the farm produce that they harvest till today. And ethnic Tibetans are the majority in Tibet today too. Infant mortality is among the lowest in Asia. The Tibetans’ literacy rate is now over 96%. Life expectancy is now over 65. Modern Tibet has schools, hospitals, clinic, five star hotels with modern amenities and wifi connections. There are also super-highways, an airport and the world’s highest and modern railway system. What more do you want? Can you say the same for the Australian or Canadian Aborigines or the Native Americans? If you want the Han Chinese to leave Tibet then how about the Europeans leave Australia, Canada, the Americas, the Falklands, Ascension island and Diego Gracia islands and NZ first? @Rob89 Defending the Chinese invasion of Tibet. You just went full retard. I am trying to conduct a civilized debate here and you resorted to name-calling. There was no invasion. Tibet has been a part of China since the end of the Yuan Dynasty. Maybe a visit to Tibet will open your eyes. Bye. ‘If you want the Chinese to leave Tibet then how about the Europeans leave Australia, Canada, the Americas, the Falkland’s, Ascension island and Diego Garcia islands and NZ first”. Seems like a ridiculous oranges and apples comparison to me. Personally I have no dog in the China-Tibet fight and see no reason at all for American forces to be in Asia or the Pacific, but your attempts to conflate the centuries old settlement of almost empty Canada and Australia with the political status of Tibet is more then a bit of a stretch. No analogy is perfect, but there are many historical parallels between the settlement of America and the Chinese conquest of Tibet. A more numerous and technologically-advanced people expanding overland into a sparsely-populated region populated by a backwards people? That’s exactly what we’re seeing in Tibet. The parallels go right down to the construction of a railroad into Tibet. Just like our Transcontinental Railroad put an end to the Indian way of life on the Great Plains, the Qinghai-Tibet Railway will put an end to the Tibetan way of life on the plateau. It’s no coincidence that the railroad began service in 2006, and the British recognized Chinese sovereignty over Tibet in 2008. Britain had been the last country to recognize Tibetan sovereignty, but they gave up when the railroad was finished. You can hold out against a handful of migrants trickling in over bad roads. You cannot hold out against the carrying capacity of a railroad. In case the nuance escapes you, the subject under discussion is the “price of the pivot to the Scarborough shoal’ but Tibet was brought in by a poster to stir the pot, after he ran out of ideas. I am not trying to “to conflate the centuries old settlement of almost empty Canada and Australia with the political status of Tibet” but just for comparison, Tibet was largely an empty land too, when the Mongols annexed it in the 13th century and incorporated it into China to start the Yuan Dynasty, while the Brits invaded and claimed Canada and Australia for the greedy British crown, circa the 18th century. Why is it good for the goose but not good for the gander? First of all, let us be very clear that there was no alleged ‘Chinese conquest of Tibet’. If you are indeed a Historian, I expect you to know that. It is also not true that “A more numerous and technologically-advanced people expanding overland into a sparsely-populated region populated by a backwards people”. “And ethnic Tibetans are the majority in Tibet today too. Infant mortality is among the lowest in Asia. The Tibetans’ literacy rate is now over 96%. Life expectancy is now over 65. Is it any wonder that Britain, which colonized almost half the world, long after Admiral Zheng He set sail in 1401 to Java, India, Persia and East Africa in 300 large Treasure ships, to trade and not to colonize any nation, only “recognized Chinese sovereignty over Tibet in 2008”? If that was not a case of sour grapes, then what was it? Why are the British “greedy” but the Chinese/Mongols are not? In any case I have no dog in the fight you seek. If it was up to me US forces would not be in Korea, Okinawa, Asia-Pacific region, etc. I see no reason for any western country to have any quarrel with China. The goose and the gander comparison was meant for the British and the Mongols. Both were voracious invaders and colonizers. China did not and has not colonized any country, even though she was the first to sail in the high seas in 1401, some 91 years before Columbus sailed to the New World, paving the way for the Spanish Conquistadors to decimate the Mayan and Aztec civilizations and the slaughter of tens of millions of Natives in the Americas. Some would ask what about Xinjiang? Well, it was annexed by the Manchus and then it was incorporated into China at the start of the Qing Dynasty, after they invaded and ruled over China from 1644 to 1911.